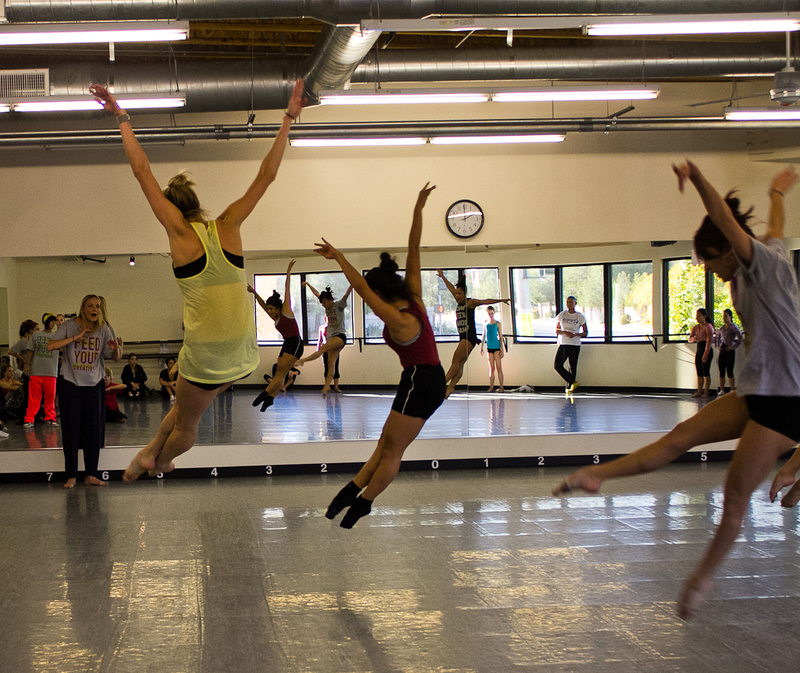 Stay up-to-date on the professional dance community in Las Vegas. Hey there! Thanks for dropping by The Las Vegas Dance Insider! Take a look around and grab the RSS feed to stay updated. See you around! If you’ve driven by or taken class at the graffiti-covered dance studio downtown called Tunay, you can probably attest to the vibrant personality and love of music and movement that emanates from the place. Jojo Peralta, the brains behind the b-boying and printing operation, was recently featured in the Las Vegas Review-Journal, which gives dancers that know him as the smiling guy behind the desk a chance to get to know what led up to Tunay. The story illustrates Peralta’s own rough-and-tumble history, from gang life to dancing to owning a studio, and his own quest to give Las Vegas teens a place to fit in. Consider it required reading if you’ve ever wondered about the street dance scene in the city, if you’re part of it yourself, or if you know someone who would like to be. Find the full story here, and find Tunay Ink at 1118 S. Main Street in Las Vegas. 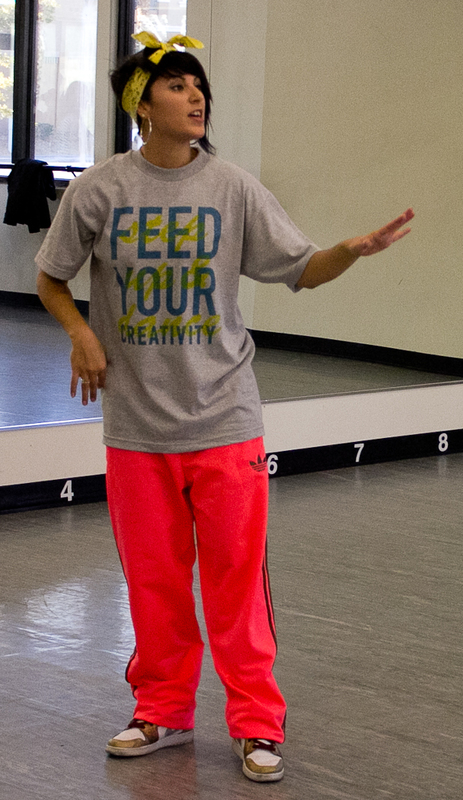 Rounis sports her "Feed Your Creativity" t-shirt, which was included for anyone who donated $20 or more. Melena Rounis, a Cirque dancer in “The Beatles LOVE,” put on the third annual Step Up and Dance fundraiser on Nov.19, which raised more than $700 in a few short hours to help feed hungry families in Nevada. Rounis’ recipe for this event has proven true over the years. For participants, it’s simple. Pay a $10 minimum donation and take your fill of half-hour-long master classes in a variety of styles. This year, teachers included Rounis herself, fellow Cirque dancers Katy Tate, Sheila Joy and Fred Odgaard, Tyrell Rolle of “The Lion King” and master locker Scoo B Doo. Around 50 people showed up to dance and donate. Participants could pick and choose from the smorgasbord of styles, which spanned the genres from old-school hip-hop and locking to burlesque, jazz and funk. Dancers of all ages and with varying experience levels got down for a good cause and Rounis said she was thrilled with the turnout this year. “I think this year was great because it had a perfect dynamic and a great number of people,” Rounis said. “There was space for everyone to dance, so I think every year has been a success. I’m not humble at all,” she continued, laughing. Katy Tate, dance captain at “LOVE,” taught what she called a “Lil Wayne” contemporary combination and concurred with Rounis about the importance of outreach. “How great is it to be able to do what you love and support those in need?,” she asked. Tate said that thinking of others is important for more than just charity. “If you’re thinking about yourself the whole time, you only have a fraction of a class,” Tate said, encouraging dancers to watch and learn from each other in dance classes. Katy Tate combined classical movement with contemporary style in her combination to Lil Wayne's "How to Love." Despite challenges of working around professionals’ schedules and organizing events remotely, Rounis said she has high hopes for the fundraiser in the future. “Honestly, since I’ve started this event, it just keeps getting better each year,” she said. Although it might seem like a long time before the next Step Up and Dance event, check out the photos below in the meantime. Street dancers holler for fellow hip hoppers and b-boys. Street dancers of all creeds converged in North Las Vegas for a showcase and fundraiser put on to raise money for Tunay Ink, a street dance studio downtown that’s ailing financially. The Dr. William U. Pearson Community Center on West Carey Avenue was bustling with dancers in Nikes, Chucks and stripes, the unofficial uniform of hip hoppers and b-boys. Tunay swag and gift cards were raffled off, street superstars Jimmy “Scoo B Doo” Foster, Bailey “Bailrok” Munoz, Jeff “J Boogie” Kelley and Ariah “Baby Wockee” made appearances, and attendees threw down in battles all over the place. 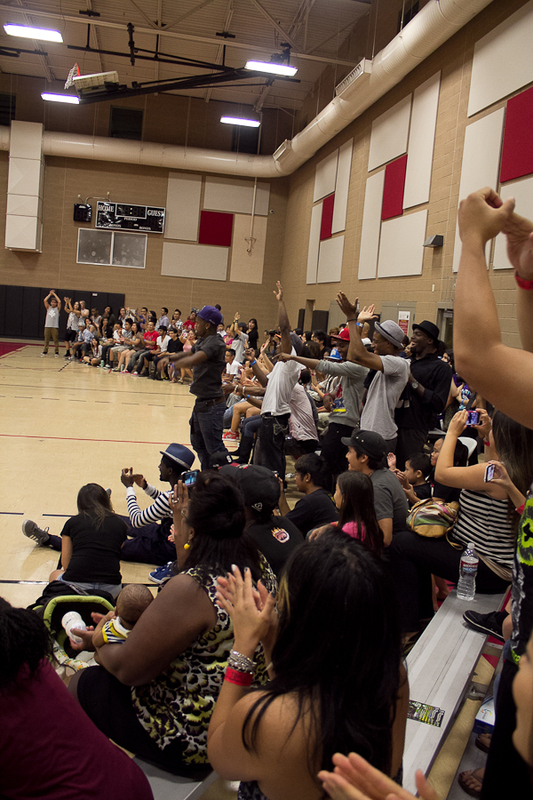 Impromptu battles aside, several performances by Las Vegas crews brought some serious funk to the event. Ground Zero, Hypnotix, Heartbreakerz, High Profile and Virtuouz Dance Krew all demonstrated the breadth of street dance and the individuality inherent in all facets of these variations. Chris Gorney, cohost of the event, kept things lively and interesting in between performances and emphasized the importance of having a studio like Tunay. This was the thread running through the showcase. Bailrok, a pint-sized member of Rock Steady Crew, The Prodigy and Future Funk, agreed with Gorney. “We should all help Jojo because he did a lot for the hip hop community,” he said. Despite these declarations, the mood of the evening was anything but somber. Contagious energy abounded and an undercurrent of affectionate competition washed over battles. Scoo B Doo, largely regarded as locking royalty, underscored this. Tunay owner Jojo Peralta manned the mic at the end of the show and talked about challenges Tunay is facing, but also of the studio’s unifying presence for the street dance community in Las Vegas. New Zealand swept up medals of gold at the World Hip Hop Dance Championships at the Orleans arena, but the U.S. crews put up a good fight. IDK, from San Diego and Los Angeles-based Instant Noodles both netted bronze medals in the Varsity (ages 13-17) and Adults (18 and older) divisions, respectively. New Zealand’s Bubble Gum and Sorority took home the gold in the Juniors (ages 7-12) and Varsity divisions. Royal Family, also from New Zealand, captured the gold medal in the MegaCrews Division, for 15 to 40 dancers. Plague, hailing from the U.K., reigned supreme in the Adults age group. The Prodigy, another Las Vegas crew in the Juniors Division, bid the competition adieu in the semifinals but strutted their stuff on KTNV Channel 13. Hoo. With more than 5,000 fans in the audience and 2,000 competitors in attendance, Hip Hop International’s World Hip Hop Dance Championships made for the best-attended street dance event to date. For some great photos, videos and interviews, check out Robin Leach’s article from the Las Vegas Sun. For a recap of Day Five from House of Crews, cue up the video below. The throw-down competition that draws thousands of dancers from all over the world is hitting it hard in Las Vegas for the fourth year running. Hip Hop International‘s USA and World Hip Hop Dance Championships are something akin to the world series of the genre, with top-notch crews battling against each other for the reigning title. Dancers span three age divisions, from elementary school kids with mad skills to adults who have been in the business for a long, long time. This is also the first year of the megacrew category, where crews can bring between 15 and 40 of their members. Today is World Battle Day, with international dancers battling in popping, locking and freestyle. Toni Basil, choreographer of Bette Midler’s show at Caesars Palace, will judge the one-upping. For play-by-play tweets of the action, check out Robin Leach on Twitter. The Las Vegas-based crew The Prodigy advanced to the world semifinals yesterday after snagging the USA title in the juniors division. This is the first crew from the city to get this far, and they’ll compete in the world semifinals on Sunday. For more hip hop excellence, check out the stories here and here from VegasDeLuxe. You can find Hip Hop International’s official YouTube channel here. For a recap of day one and for links to more videos, cue up the video below. Become an Insider--subscribe and receive notifications of new posts by e-mail.